The exceptional sound of Everest 35mm Magnetic Film Recordings returns! Ten Everest titles, each a 2LP 45 RPM release! 45 RPM versions have never been issued! Mastered directly from the original 35mm magnetic film using an "all tube" cutting system! Among Classic Records' highlight accomplishments — before the label sold in 2010 to Acoustic Sounds — was unlocking the audio majesty of the Everest 35mm magnetic film recordings on a groundbreaking reissue series. Now, return with us, as Classic Records by Analogue Productions returns this vintage audiophile collection to its rightful glory. Everest LPs through the early 1960s were recorded on 3-channel 35mm magnetic film recording equipment. 35mm magnetic film yielded greater fidelity and less noise than standard 1/4" recording tape. The Westrex Corporation built special equipment to Everest's specifications to accomplish these advantages. Fast forward to today: Classic Records by Analogue Productions is resurrecting this collection through an initial 10-title reissue series. Bernie Grundman cut the Classic Records reissues at both 33 and 45 RPM - the 45 RPM versions have never been reissued! • Quality Record Pressings 200-gram flat profile LPs - These records are pressed with a flat-edge, no groove-guard flat profile, like the originals. The flat edge refers to the absence of a raised, beaded lip on the outer edge of the record, providing a flat playing surface - and no incline - on your turntable. Quality Record Pressings' quality is legendary and these flat profile 200-gram platters will look and sound exceptional! Each 2LP set comes with a Stoughton Printing tip-on original jacket and an Everest Records branded jacket showing photos of each reissue title. The two LPs are packaged in a protective clear sleeve. Sergei Prokofiev Symphony No. 5 in B-Flat Major, Op. 100, London Symphony Orchestra, Sir Malcolm Sargent, conductor. It has been said that "the Fifth Symphony embodies the highest achievements of Prokofiev the orchestrator, uniting an intoxicating many-colored palette with a clean discipline of orchestral development." Nowhere in recorded form have these orchestral colors been captured with such startling fidelity in large part due to the efforts of Everest as a pioneer in the art of 35MM magnetic tape recording under the supervision of Bert Whyte. 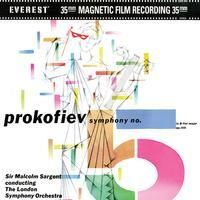 These Prokofiev 5th sessions were recorded in 1959 at Walthamstow Town Assemby Hall, London (location of many Wilkinson / Decca recordings) with Sir Malcolm Sargent conducting the London Symphony and directly onto 3 channels of 35mm magnetic tape.